Below are questions we get asked frequently. Click on the question to view the answer. If you have additional questions, please feel free to contact us directly. How long has Precision Roofing been in business? 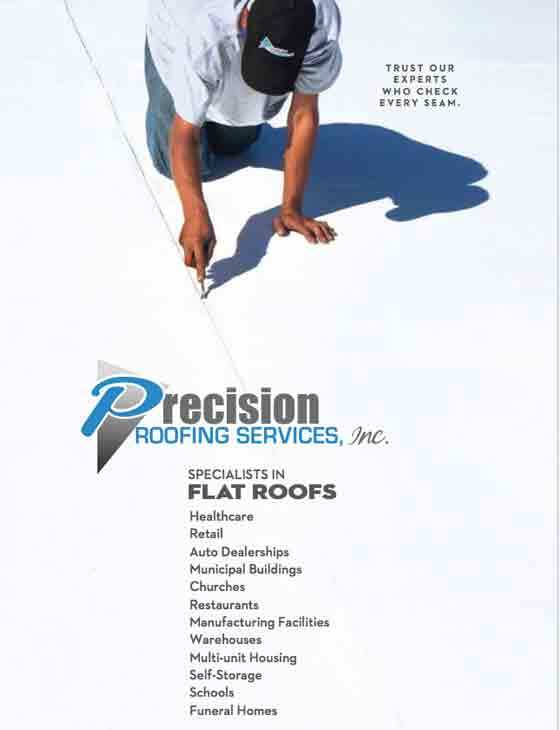 Precision Roofing has been in business since 1987. What is Precision Roofing’s service area? Generally Precision Roofing serves the entire southeastern Wisconsin area. Depending on the size of your project, we are willing to travel outside of that area. 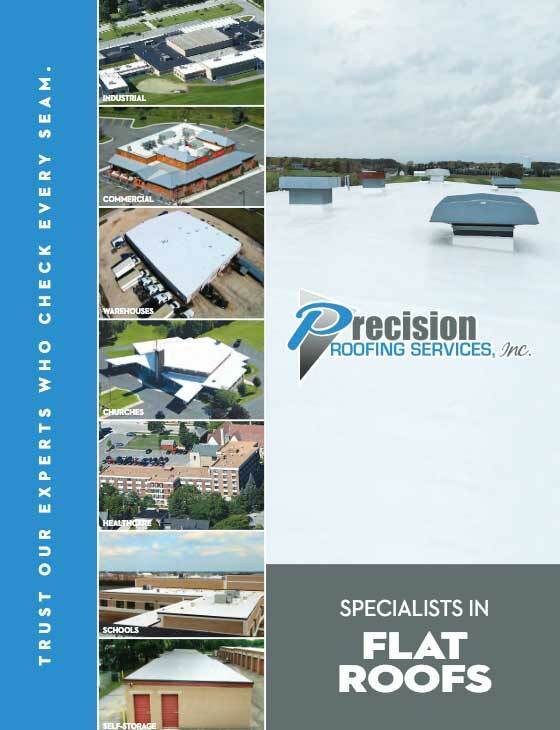 What type of roofing projects has Precision Roofing completed? Flat roofing is our specialty. We’ve installed roofs on these building types: industrial/manufacturing facilities, schools, churches, hotels, healthcare, warehouses, restaurants, self-storage facilities, retail, auto dealerships, municipal buildings, multi-unit housing, funeral homes, and small businesses. If you have a commercial or industrial building and don’t see it listed, please contact us. What do I do to begin a project? When you are wondering if your roof needs to be repaired or replaced, or need to know a budget to allocate for a future roofing project, the Precision Roofing staff can examine/access your existing roof and provide a complimentary proposal. This proposal includes detailed measurements of your roof and details such as protrusions and rooftop equipment, materials required, and all the services to complete the installation. What are Precision Roofing’s onsite procedures? The Precision team’s first priority is to set up per OSHA safety requirements. We designate an area to supply the installation crew with materials while using the least amount of your space and assuring you can conduct business as usual. For many roofing projects, we install the membrane system over the existing roof, which saves time and the falling debris from tearing off the old roof. The roof installation is completed in stages to assure that what we remove is covered on the same day. Sheet metal edge trim and final inspection of all the seams are the final procedures. A project manager is available during and after the project when you have questions. The length of time the project will require depends on the size, type, and specific details of your roof, but generally plan from one to two weeks. What about Worker’s Comp, General Liability and Licensing? Precision Roofing carries all required Worker’s Compensation coverage, general liability insurance, and state licenses. Building permits are purchased by Precision Roofing. Does Precision Roofing add vents? Yes, ventilation is installed per building codes or as a custom installation depending upon the existing conditions and your specific needs. Does Precision Roofing replace rotten wood? Yes, rotten or damaged wood or steel decking is always replaced as needed to ensure a solid base for the new roof. The length of time a roof installation requires depends on the size, type, and specific details of your roof. Generally plan on about one to two weeks. During winter, since the roofing materials are neither weather dependent nor temperature sensitive, Precision continues to install roofs. Naturally there are seasonal times of the year (spring and fall) that are busier. And, while we approach all projects in the order we receive the approval to begin, if your roof needs to be covered to protect it from the elements, we will do that until we can begin the installation of the new roof. Precision Roofing requires a down payment for the materials before we place the order for the membrane roofing system. The balance of the amount due is expected on completion of the installed roof.